Mizoram is one of the Seven Sister states of North-East India. It shares its borders with the states of Tripura, Assam, Manipur and with the neighbouring countries of Bangladesh and Burma. Its capital is Aizawl and it became the 23rd state of India on 20 February 1987. Mizoram has two seats in the Parliament, one each in the Lok Sabha and in the Rajya Sabha. The main political parties in the state are Congress, the Mizo National Front and the Mizo People's Conference. Lal Thanhawla is the current Chief Minister of the state. He was the CM from 1984-86, 1987-1998 and since 2008. He joined the Congress in 1967. His rival in the state is Zoramthanga, who joined the MNF in 1966. He led his party to victory in 1998 and 2003 but lost his seat in 2008. People living in the Mizo Hills were mostly referred to as the cucis or kukis by their neighbouring ethnic groups. Before the Britishers came to India, the various Mizo clans lived in autonomous villages and the tribal chief of these villages wielded a certain amount of power and were absolute rulers of their respective clans. 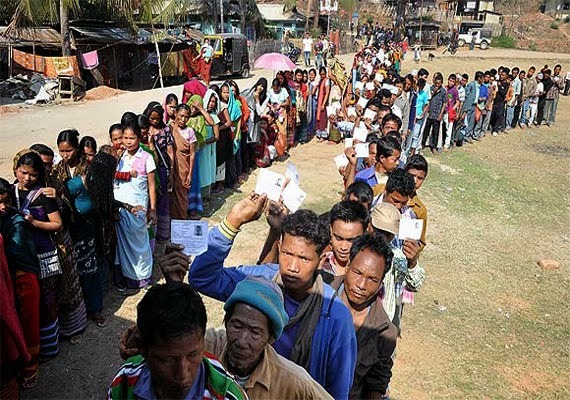 However, they remained under the nominal political jurisdictions of the Rajas of Manipur, Tripura and Burma. The Mizo Hills formally became part of British India in 1895, and a part of the Assam province in 1895. When the British left India, the number of tribal chiefs had increased over 200. The educated Mizos started a campaign against the tribal chiefdom under the banner of Mizo Union. As a result, the rights of the 259 chiefs were abolished under the Assam-Lushai District (Acquisition of Chief's Rights) Act, 1954. Later the representatives of the Lushai Hills Autonomous District Council and the Mizo Union pleaded with the States Reorganisation Commission (SRC) to integrate the Mizo-dominated areas of Tripura and Manipur with the District Council in Assam. But the tribal leaders in the northeast, who were unhappy with the final SRC recommendations, formed a new political party in 1955, Eastern India Tribal Union (EITU) and raised a demand for a separate state comprising all the hill districts of Assam, Their demand was not accepted by the government. Later, the Mizo National Famine Front, a body formed for famine relief in 1959, developed into a new political organisation, the Mizo National Front (MNF) in 1961 and it sought sovereign independence for the Mizo territory. The front was outlawed in 1967. However, in 1971, the government agreed to convert the Mizo Hills into a Union Territory, which came into being as Mizoram in 1972. It was declared a full-fledged state of India in 1987 following the Mizoram Peace Accord in 1986 between the government and the MNF. Hills, valleys, rivers and lakes – this is what Mizoram comprises of. There are as many as 21 major hill ranges or peaks of different heights run through the length and breadth of the state. The Blue Mountain or the Phawngpui Tlang is situated in the south-eastern part of the state. Mizoram's biggest river is Chhimtuipui. It is also known as Kaladan. It originates in Chin state in Burma and goes back to Burma's Rakhine state. The important rivers of the state are the Tlawng, Tut, Tuirial and Tuivawl which flow through the northern territory. As for the lakes, the Pala is the biggest in Mizoram. It is situated in Saiha district which is part of southern Mizoram covering 30 hectares. On the other hand, the Tam Dil Lake is a natural lake situated 85 kilometres from Aizawl. The lake is an important tourist attraction and a holiday resort. As per the 2011 census report, Mizoram has literacy rate of 91.58% and has the second-highest urbanisation rate in India with 22 towns included. Majority of the population of the state consists of several ethnic tribes who are either culturally or linguistically linked and they are collectively known as Mizos, which include Lushei, Paite, Lai, Mara, Ralte, Hmar, Thadou and several other tribes. Further, these tribes are divided into numerous clans within themselves, and these clans are further sub-divided into sub-clans. These clans may have slight liguistics differences at times. Majority of the Mizos are Christian and Hindus are in minority. There are also Buddhists and Muslims in the state. The official language of the state is Mizo. However, English is widely used for administration, governance and education. Mizo is one of the languages with official status in India (at the state level). But Hindi is a compulsory subject for all students up to eighth standard.